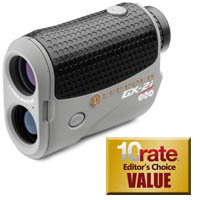 This is a very nice new rangefinder from Leupold which gives the golfer fast feedback and has lots of options and versatility like customizable adjustments for slope, altitude, termperature, and a proprietary feature called TGR – true golf range. It also has Pinhunter technology for those courses participating. I dont think I would ever use the individual hitting strength feature as we all know that we have days we are hitting it longer and shorter. But it’s there if you want to program in your yardages for clubs and use the rangefinder for club selection.